This time I will make the power supply without the use of a conventional transformer to save costs, this symmetrical power supply 350W power. This unit will replace the transformer / power supply is in the power amplifier supply audio standards to reduce costs and weight. Transformer power amp is initially burned and if buying expensive. Power supply that we make this work as a half-bridge with no regulation,frequency above 50kHz. Power supply for the drivers I rely on two N MOSFET and run by the IR2153 IC integrated circuits. In the IR2153 IC is powered by a power resistor 27K 6W. Ripple at full load noted below 2V. The use of Zener diode (15V) ensures the stabilization of voltage and operating frequency is set to 50 kHz (approx.). At the entry point, I have put a thermistor to force a check on a peak current when the capacitor charging. The same phenomenon can be found in the Power Supply AT / ATX computer power supply unit. In addition, to ensure low leakage inductance and the output voltage is full, the first half of primary winding in 20 rounds followed by a secondary coil. Also to ensure safety in the system, be sure to connect the output (Ground 0V) to earth. The number of windings and a ferrite core, often found in the supply of PC is not an important factor. In addition, the 6k8 resistor at the output is used to discharge the capacitor after turned off and in this way helps to prevent voltage rise during no load. In addition, it is also feasible to spread the original primary bottom without roll over. Type appropriate power supply for power amplifier applications. If necessary may be well guarded against overload or short circuit and the output voltage can be stabilized. The response of the system can be activated through the help of the optocoupler. MOSFETs can also be used to lower the resistance point. Interestingly, the smaller the resistance the better is the system. Tolerance voltage in the range 900-1000V. Given this, I found the best MOSFET is SPP17N80C3 or 900V IGBTs.Jika difficult to obtain the above type can also use IRFP460. For the primary side coil consists of 40 rounds with a diameter of 0.6mm enameled wire. Remember to stop after 20 laps, and put a layer of insulation with insulating tape as the distance between the secondary winding, secondary windings using 0.6mm wire diameter X 4 used a number of windings 14 coiled X 2 so 14lilit CT 14lilit wrapped neat. after the secondary winding is then covered again and continue with the rest of the primary winding 20 more laps on it. So the secondary coil will be sandwiched between the primary winding 20 + 20 rounds. The center tap 20 + 20 can be connected with the body SMP for enhanced stabilization and clean in terms of output ripple or disturbance buzzing. 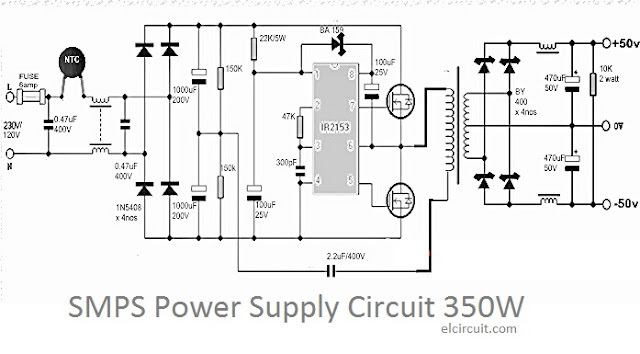 This Project originally posted by Dear Swagatam CEO of homemade-circuits.com, you can view original article on this link: http://www.homemade-circuits.com/2014/06/smps-2-x-50v-350w-circuit-for-audio.html, He the best man electronic circuit designer.